After a lion kills the village leader, the expected rains fail to arrive, so a group of warriors are sent to hunt the lion down and kill it in hopes that the rains will come at last. A high school has a tradition of dirty deeds the night before homecoming (if there's any volunteer) where, to win, the person performs 10 dirty deeds in 12 hours. Will Harper make it? Kendra gets a teacher's award and her photo in the papers. Her criminal twin sister sees the photo. She blames Kendra for being left at the orphanage and wants to take over Kendra's perfect job, home and husband. As poor as my French is, I understood only about one-third of the dialog, and I still found this film enthralling. 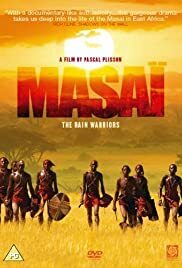 A heroic journey is undertaken by a group of young Masai warriors in an attempt to save their village from drought and death. They encounter dangers from nature and man along the way. One of the most intriguing aspects to me is that there are surprising characteristics that emerge among the warriors, and the heroes are not who you might expect. The film also has a highly authentic look to it. I have lived in Africa for several years and always cringe at the way village life is prettied- up in so many films; there is little of that here (but neither is it gratuitously gory). I will definitely watch it again (hopefully with subtitles next time).